My name is Jeff Young and I am a Liverpool based writer for stage, radio, TV, film, poetry and spoken word, site specific projects, sound art and installations. Some of my projects can be found in the filing cabinet to the left. A lot of this work is my response to the city I live in – ways of chronicling my love affair with it’s ghost memories, it’s dream-states, it’s derelict cinemas and hallucinations. Currently – amongst many projects – I am under commission to the Liverpool Everyman to write a play exploring these dream-excavations. In all the years I’ve been writing I have lugged my work around from house to house, rarely unpacking the notebooks, scribbled on envelopes, tattered scripts, scrapbooks, diaries, journals and ephemera. These pages will be the place I now unpack them. For twenty five years I have worked as a writer of poetry, spoken word, stage plays, installations, radio dramas and documentaries, TV dramas, screenplays, public and community art, collaborative and cross art projects, puppet shows, children’s theatre, site specific performances in industrial and derelict buildings, billboards…stuff. A lot of this stuff has been lost. In fact lots of theatre scripts fell out of a moving transit van somewhere on the M1 and were never seen again. But some of this stuff – for better or worse – has survived and festered in various cellars and attics. On October 27th the Everyman and Playhouse hosted an installation called Jeff’s Brain in the cellar of the old art school here in Liverpool; this was the first time my archive of damp, torn, wine stained materials had been exposed to scrutiny for ages. 25 years worth of notebooks and scripts, public art works and photographs were emptied into the cellar room by the wonderful Jill Heslop and for five hours anyone who wanted to could come and have a look. Every fifteen minutes there was a performance of some kind; films were shown, projections flickered on the walls. Billboard poems came out of storage, sound art pieces were broadcast and we all drank absinthe out of trifle bowls. Throughout the day the musician Martin Heslop and I wrote a piece about Jeff Nuttall who we saw as being the genius loci of the building; we attempted to summon his ghost with a final performance at the end of the day in the cellar of the art school where he once lurked. The Jeff’s Brain installation was the live event predecessor to these pages in a way. It was somewhere to unpack and sift the archive of twenty five years work and give it some fresh – absinthe tainted – air. So now we have this website. Periodically I will upload more archive work, and, as new work develops it will find a home here in some form. The photograph at the top of the page was taken in 1914. 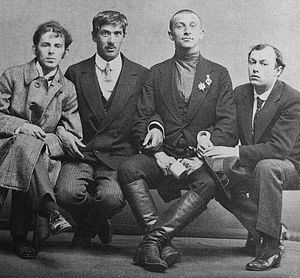 It shows the poet Osip Mandelshtam, critic Kornei Chukovsky, illustrator Iurii Annenkov and the Futurist poet Benedikt Livshits. These dissident radicals wouldn’t have been allowed to have websites – there’s a good chance they wouldn’t have wanted to, but I love this photo of these rather delinquent looking geniuses and , for now it will be their faces welcoming you if you choose to enter here. Hi Jeff, great to see all those years of hard work paid off for you. Very proud of the work you’ve done and being one of the family. Drop me a mail sometime. Jeff, will you be so good as to e-mail me from this link, so that I’ll have an e-mail address for you? There’s something I’d like to send. 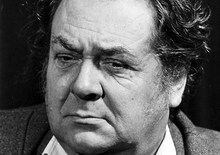 Hi Jeff, Found your blog as a result of hearing today’s play on Radio 4 – The Exuberant. BBC info only gives the name, which, like the play, I hope belongs to you! Assuming this is so, then congratulations on such an interesting, amusing and even poetic piece, made out of a falling star. Hope you will understand and forgive the impulse to share with you a poem I wrote recently, “Comet or Meteor”, the first of two on this link http://jpfgoodman.wordpress.com/2013/08/16/the-same-old-story-over-and-over-again/ , which was inspired by the Perseid meteor shower! Pretty sure that the play is a lot better researched than the poem! I’d like to add my own thanks for “The Exuberant”. I listen to BBC Drama of the Week on podcast regularly; this was one of my favorites. Thanks Bruce! One never knows if anyone is out there listening so its great to hear from people like you. Cheers. Liz Ascroft here… designer on “Man In The Moon” about 53 years ago….!!!!! ongratulations’ this way. Hope it went well. Im in the middle of tech with Chahine’s partner Rox, in Birmingham. Hope you are well and dandy.